The museum in Reading has the only full size copy of the Bayeux Tapestry. It is excellently displayed and well worth a visit. The story of how it came to be made is told below but it is worth learning what we can from the work they have done. 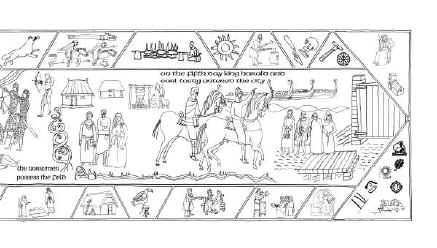 Some useful lessons can be learned from this full sized copy of the Bayeux Tapestry. Modern needles and fabric are finer which probably made it easier for modern embroiderers to work the finer details. Using smaller, closer stitches, more subtlety has been put into the shape and expression to the faces and fingers. However, there is a tendency to be naturalistic which does not always work well in this media. Oddly, the face of Aelfgyva, which incorporates more detail, is not good as the original. The images are caricatures and more is not necessarily better. The basic pallet is provided by the natural dyes. The shades produced work very well in the original. Attempts to enhance the images by adding extra colours is not altogether successful. By selecting the correct strands from among the shanks all the subtlety required can be achieved. The choice of colours does not need to be natural. There are no fixed rules but it is important to plan the colours to be used for a figure to make sure that you do not ‘run-out’ of colours or have inappropriate or identical colour meeting each other. The embroiders seem to avoid contrasting colours and some of the impact of the images is lost. Using a different colour for the legs of a horse works in the original. The key seems to be visual impact and context. There can be colour confusion when objects meet. To make sure that a limb is not lost in the background, a lighter colour, however unrealistic, can work within the conventions of the tapestry. So be bold in the choice of colours. Some of the horses are much better than others. It is puzzling that the execution should vary so much. Were the workers less familiar with horses than the original work force? There are fewer horses in the Preface but a degree of familiarity and confidence with the object being worked might be useful. Each section in the Reading copy was the work of one single embroiderer who added their signature at the end of the panel. The effect is to produce a discontinuity in style when the panels meet. It is very clear that some took a while to master the stitches. Within the original, there is some evidence of different skill levels and this does not detract from the impression because the design is symbolic rather than naturalistic. To avoid this problem, the work will be undertaken by a team of mixed skill and one can be confident that people will not over-reach themselves.